Refreshed styling, engine, and interior equipment keep the slant-backed luxury crossover at the top of its game. Just a few weeks ago, Mercedes revealed a mid-cycle refresh for the GLC crossover. 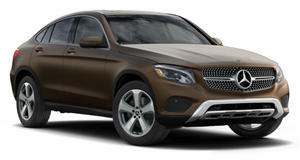 Now it's done the same with its more rakish counterpart, the GLC Coupe. Set to debut next month at the 2019 New York Auto Show, the new GLC Coupe benefits from similar enhancements to those applied to its more conventionally shaped stablemate. And with it, the Silver Star automaker undoubtedly aims to attract more buyers away from the BMW X4 while solidifying the GLC range's place at the top of the increasingly competitive market for compact luxury crossovers. The tweaked styling starts with the bold "diamond-block” grille, flanked by reworked LED headlamps and capping reprofiled air intakes. Chrome accents highlight its essentially sporty silhouette, from the more steeply swept-back A-pillars to the sloping rear of the roofline that sets it apart from the standard model. There's a new diffuser element at the back, with underbody cladding, new tailpipe finishers, and LED tail lamps as well. Mercedes has also taken the opportunity to upgrade the interior, packing its latest 10.25-inch MBUX infotainment screen and touchpad control atop a redesigned center console. The system can also be controlled by voice and gesture. There's also a new multifunction steering wheel in front of the 12.3-inch digital instrument cluster. New driver assistance systems (namely distance control and steering assist) join the long list of standard and optional technologies. And the engine's been enhanced as well. The 2.0-liter turbo four now produces 255 horsepower (up from 241 hp) and 273 lb-ft of torque (same as before). It's the only engine available at launch in the US, but other customers in other markets can opt for the less potent version of the same (with 197 hp) as well as a trio of diesels with 163, 194, or 245 horses. What enthusiasts can really look forward to, though, are the new AMG versions that are sure to follow. The existing GLC Coupe has been offered in AMG GLC 43, 63, and 63 S specs. The latter (and most powerful) version packs 503 hp and 516 lb-ft – enough to rocket to 60 in 3.7 seconds and steal the lap record for SUVs at the Nürburgring away from the Alfa Romeo Stelvio Quadrifoglio. With the arrival of the new BMW X4 M, Jaguar F-Pace SVR, and Range Rover Velar SVAutobiography Dynamic, the boys in Affalterbach will surely want to stay ahead of the pack. In the meantime, US dealers will start delivering examples of the updated GLC 300 later this year as part of a seven-model sport-ute lineup under the Silver Star (alongside the "standard" GLC, the smaller GLA, and the larger GLE and GLE Coupe, GLS, and G-Class). By then we can anticipate Mercedes to reveal revised pricing, but we wouldn't expect it to veer too far from the $47,300 at which the outgoing, pre-facelited model is priced.